Call us at Cool Comfort Heating & Air for a trustworthy air conditioning repair in Davidson. If you’re facing an air conditioning repair, you might be tempted to call the first number you come across and pay whatever the cost just to get your home back to a livable temperature again! However, be aware that some companies or individuals will prey on people in this circumstance and quote high prices for repair work just because they know you’re desperate. Here at Cool Comfort Heating & Air, we want you to feel confident that you are getting a quality air conditioning repair for a fair price. We have some tips to help you avoid being bestedAir Conditioning Repair by potential scams. When you have someone come out to look at your air conditioning unit and they quote you a large price to get it repaired, it’s always a good idea to get a second opinion. Most reputable heating and cooling companies are willing to give you a quote and won’t be surprised when you tell them you want another quote from another company. 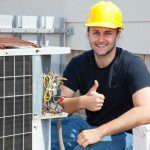 Air conditioning repair can often be a large expenditure, and when you are solely relying on the expertise of the company, it doesn’t hurt to get a second opinion. But price isn’t everything. If another company quotes you a lower price but gives you the stipulation that it must be done quick or they’ll raise the price, this is a red flag. A reputable company will allow you some time to do your research and make a decision without pressure. Trustworthy cooling companies will be well known in the area and should be able to provide plenty of references of happy customers. At Cool Comfort Heating & Air, we have been serving the Davidson, North Carolina area for over 15 years. We are local and love our community and our customers. We know an air conditioning repair is never a fun expense, but we feel confident that you will love working with us and will love the result of having your cool home back!